I’ve heard getting the flu shot can actually make you sick! Is this true? 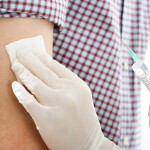 Should I get a flu shot? Posted November 5, 2014 under Ask Us. This is a very common question! Many people believe that getting a flu shot can give you the flu, but it’s simply not true. There is no active flu virus in the shot, so it’s impossible for the shot to give you the flu. There are two reasons this myth exists. The first is that the flu vaccine does occasionally give people a fever, but this is not the same as the flu, and it goes away quickly. The second is that the flu vaccine doesn’t begin working immediately, so it is possible to get the flu from another source before the vaccine starts working. It can take up to two weeks for the vaccine to fully protect your body, so if you are exposed to the flu virus in that time, it’s possible you will get the flu even after getting the flu vaccine (although it is not caused by the flu vaccine). To sum up, get your flu shot! It is the best way to protect yourself from getting sick.